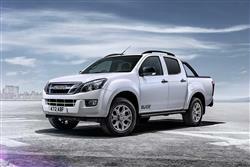 Find out everything you need to know on the new Isuzu D-max from independent vehicle review website Car And Driving. You can watch the video review to the left to see more of the car or read their written review below to get a true insight from an expert in the automotive industry. Think pick up and you'll probably reckon on a Toyota Hilux, or a Mitsubishi L200, possibly even a Nissan Navara, a Volkswagen Amarok or a Ford Ranger. If you're in the market for this sort of vehicle on he used market though, there's another name that would be wholly remiss to leave from your shortlist; the Isuzu D-Max. A more refined successor to the bulletproof Rodeo, the D-Max has carved itself a niche in this most hotly-contested sector. Throughout its production life, it was a vehicle that proved to be especially popular in its upper-spec doublecab guises. It was to capitalise on this demand that in 2014, the UK importers introduced the limited-run 'Blade' variant that proved so successful that they followed it up with the upgraded 'Blade 2' model that we're going to look at here as a potential used buy. Will it make a good used option for lifestyle pick-up buyers? Read on. Following an original launch in 2012, Isuzu's D-Max pick-up carved itself a useful niche in the pick-up market, mainly thanks to the way its brand listened and responded to the needs of likely buyers. A number of owners told the marque that they'd like a really luxuriously equipped variant, hence the announcement of a special edition version, badged the 'Bade', in 2014. This derivative featured a whole host of extras included at an attractive asking price and was so popular that Isuzu further refined it to create the 'Blade 2' model that we're going to look at here as a used buy, a pick-up that delivers arguably the smartest cabin in the class, along with a few little extra touches to make ownership feel that little bit more special. This version sold until the Spring of 2017, when it was replaced by an updated model featuring a more efficient 1.9-litre diesel engine. This upgraded D-Max Blade model certainly looks the part, offering those who want a leisure-oriented used pick-up something that's has some genuine visual impact. The eighteen-inch six-spoke alloy wheels help here, and they're shod with some meaty-looking 255/60-18 Pirelli Scorpion Zero tyres. The front grille is smarter than it was in the original Blade model, finished in a sleek dark grey tone that matches those wheels, while the door handles and roof bars are painted in black, as are the folding door mirrors. Even the heavy-duty side steps don't go too big in chrome. Two paint colour choices were offered to new model buyers. The 'Pearl White' finish looks clean, but the Blade definitely looks meanest in mica Cosmic black. For Isuzu, a priority in updating the Blade package was to introduce a classier feel to the cabin and you certainly get that with the upgraded Piano Black interior with its smart roof lining. The cab is still sturdy and practical though, if far from basic with its clever Pioneer stereo, branded mats and smart scuff plates. It also helps that the D-Max design is in many respects quite stylish in its own right, the circle of minor controls on the centre stack for example, reminiscent of a Mazda RX-8 sportscar, plus a couple of ventilation 'ears' at the top of the fascia that aren't a million miles away from contemporary Ford design. Ease of use was also thoroughly thought through, with wheel-mounted controls, big clear dials, easy access to the most important switches and a comfortable raised driving position. Move rearwards and there's even a decent amount of rear seat legroom, which isn't always the case with doublecabs like this one. You'll want to know about equipment. From a practicality perspective, there's an under-rail bed liner, heavy-duty side steps, a tailgate damper, a spare wheel cradle and black roof bars. From new, buyers were given the choice of two hard tops: a lockable colour-coded Aeroklas leisure canopy complete with internal light. Or a lockable black MountainTop Black Roller with black rear style bar. Inside, the Blade features a DAB digital radio inregrated into a Pioneer AVIC-F960 6.1-inch touchscreen navigation set-up, complete with integrated rear safety camera and a rear speaker system. Plus there's a premium black leather interior, heated front seats, branded floor mats and scuff plates. Bear in mind too that all of this buillt upon the already very complete specification of the D-Max 'Utah' model. So you also get desirable features like automatic climate control. Options that many new buyers went for include a bonnet protector, a loadbay bed rug, trendy lazer lights and a spare wheel bag. Around £20,000 to £25,000 is the kind of budget you'll typically need for a D-Max Blade 2, but used pick-up trucks are difficult vehicles to attach accurate values to. Some double-cab models will have lived out a relatively easy life as a family car and on the daily commute. Others will have been put through their paces off-road on a daily basis with all manner of undesirable payloads shovelled in the back. It's best, therefore, to inspect each model carefully and price them on an individual basis. We reckon you'll be pretty safe with this high-spec version, as few buyers will have purchased it with an arduous ownership life in mind. Find one with a reasonably low mileage and you'll have got yourself a decent buy. The condition of a used pick-up is very important because the kind of use they've been put through will vary greatly. Check the underside of the vehicle, the sills and the wheels for evidence of off-roading damage and take a good look around the interior of the loadbay. In general, Isuzu has a great reputation for reliability and the mechanicals of the D-Max should be strong enough. There are plenty of satisfied D-Max Blade owners out there, but we did come across a few who had issues. In one case, an owner complained that the engine wouldn't rev; it's an issue that tends to relate to faults with either the connector to the throttle position sensor or the crank angle sensor. In another instance, the owner concerned noticed a knocking sound that set in when coming to a halt in a D-Max that had covered about 20,000 miles. Another owner had a problem with a water-logged diff that entailed the need for an expensive replacement. And another buyer complained of a camshaft chain/ oil pressure-related noise from the engine. There were also a few instances of niggling radio head unit faults. Otherwise, the only issues are the ones common to all pick-ups. So check that the loadbay doesn't have too many scrapes and dents. And look underneath the vehicle for signs of over-enthusiastic off roading. (Based on a 2014 2.5-litre D-Max Blade) A pair of brake discs cost in the £25 to £34 bracket, while a pair of pads tend to retail in the £22 to £25 bracket. For a wiper blade, you're looking in the £4 to £10 bracket. For a fuel filter, expect to pay in the £6 to £12 bracket. A wheel bearing kit will cost you in the £20 to £30 bracket. The Isuzu D-Max Blade II gets the same fuel efficient 2.5-litre twin-turbo common rail diesel engine as the rest of the D-Max range, offered with a choice of either six-speed manual or five-speed automatic transmissions. This advanced Euro5-compliant unit generates 163PS and peak torque output of 400Nm at 1400 rpm. Like other D-Max models, this one used a 'shift-on-the-fly' system, allowing the driver to adjust between two and four-wheel drive modes while travelling at speeds of up to 60mph. The front suspension comprises an independent double wishbone with coil-spring set-up, while the rear suspension is made up of over slung leaf-springs installed above a special long span rear axle. Isuzu claimed this offered better driving comfort. Like the Rodeo before it, the D-Max was built on a rugged ladder-framed chassis, but the similarities ended there. The i-GRIP (Isuzu Gravity Responsive Intelligent Platform) underpinnings of the D-Max are 42 per cent stiffer than those of the old Rodeo chassis, helped by improved cross bracing at the rear, which offers superior stability under load and when towing. Back in 2016, this D-Max Blade 2 showed what a complete product Isuzu could offer in the lifestyle end of the growing pick-up segment. It's certainly hard to think of anything else you could add to it by the standards of the period. Eighteen-inch alloy wheels, a DAB stereo, sat nav, climate control, heated leather seats, mica paintwork, a choice of a cannopy or a roll-top to keep your gear safe - it's all there in the asking price. Who says you can't have it all?